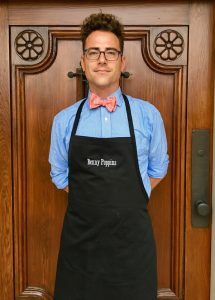 Each series has one breakout character, and while the Bravo Southern Charm New Orleans series offered little to locals other than indigestion, it did present us with the sass of New Orleans’ private cook, Mr. Benny Poppins. Poppins, aka Benjamin Levasseur, originally from Algiers, plies his trade amongst New Orleans’ families as a personal cook. “The name ‘Benny Poppins’ came from working closely with families and their children as a personal chef, and it stuck,” said Levasseur. In the Bravo series, Benny Poppins, of the bow tie, eye-roll and discreet side-eye proved popular amongst the audience who enjoyed the series. 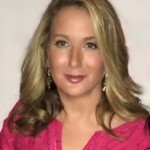 Levasseur portrays the cook and private assistant to New York documentary film producer Nicelle Herrington – also a real-life gig. It was Herrington’s friendship that brought Poppins to the series’ original auditions with the Bravo series show-runner Whitney Sudler-Smith. In true southern style, mimosas needed to be delivered, a lifestyle created, menus planned, and dinner parties hosted. Poppins rose to the occasion. He learned not only to prepare “elite” luncheons but to also maintain attractive and tasty dishes during long television shooting schedules – amid guests with questionable manners. New Orleans does not claim Carolina Shrimp and Grits or She-Crab Soup as local cuisine, but both dishes were featured on the Bravo series via Poppins (or so I’m told). I had only viewed the premiere – that was enough. However, after speaking to Poppins, it was recommended that I watch Episode 4, the Swamp Tour episode. It seems the producers contrived an actual swamp boat dinner party for which Poppins was the chef de cuisine. I headed to Bravo.com to view the drama. All cooks and chefs have their problems, but catering a dinner party with no electricity, no water, and a long day of “personalities” filming in the swamp must have been a doozy. Poppins’ solution was ice, advance prep, picnic foods such as cold crawfish salad, seared fish cakes, banana puddings, and lots of Mason jars. I have to give Poppins credit for perseverance and ingenuity. Of course, locals do not go on swamp tours or host cold dinner parties amongst water snakes and mosquitos; however, Nicelle had a vision and Poppins delivered, monogrammed apron, bow tie and all. “I’m sassy in general, but it was really hard trying to be professional in such an odd place,” said Levasseur. An LSU alum, Levasseur spent his formative years moving between New Orleans and North Carolina, which inspires his blend of low-country Nola cooking style. He credits his love of cooking to his paternal grandfather Luther and his informal training to Chef Baker Guevarra of Carrollton’s Ye Ole College Inn and Chef Dirk Dantin of Rock n’ Sake. Currently, he cooks for several local families, including the owners of Domain Companies, Preservation Hall, and the Solomon Group. Goals include chances to visit, observe and learn techniques in the kitchen’s of local prominent chefs. At present, Southern Charm: New Orleans has not been renewed for a second season. 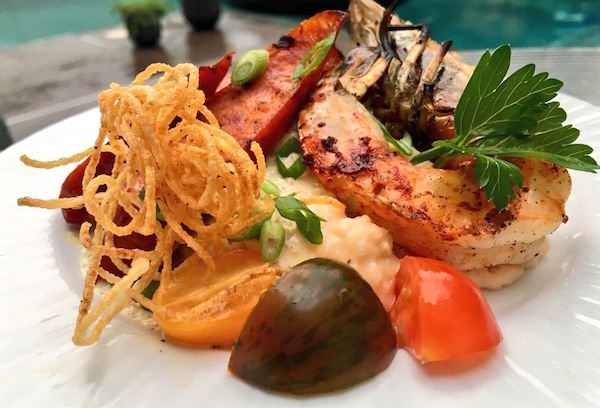 “Shrimp and grits is originally a low country recipe, but mine has components of Louisiana, which marries my experiences from both New Orleans and the Carolinas,” said Levasseur. The dish is served alongside grilled Andouille sausage. Salt water, bring to boil, then add grits, whisk in butter and gradually add cheddar and cheese. Continue whisking for the creamiest consistency. Sauté Tasso and shallots in butter until the Tasso is browned and the shallots are translucent. Add cream and reduce on a simmer for 10-15 minutes. While simmering add chicken base and white pepper, stirring to reduccream sauce. 1 tbsp. of olive oil and butter mixture. Rinse and pat dry shrimp, toss in seasoning, then sauté 1-3 minutes until no longer translucent. Spiral cut one red potato. Rinse until water is clear, then gently pat dry. Flash fry in avocado or corn oil. Drain on paper and season with blackening seasoning or Tony Chachere’s. Garnish dish with potato strings, sliced scallions, and chopped parsley. Serve alongside grilled Andouille sausage and a cherry tomato and arugula mixture tossed with Steen’s Cane Vinegar and extra-virgin olive oil. Bon Appétit!